See our Coupon and Specials pages for monthly discounts on many popular products. We give a 10% senior discount everyday on most products. We give a 10% discount everyday on supplements if you belong to a fitness club or you are a military veteran. These discounts are not applicable to already discounted products. 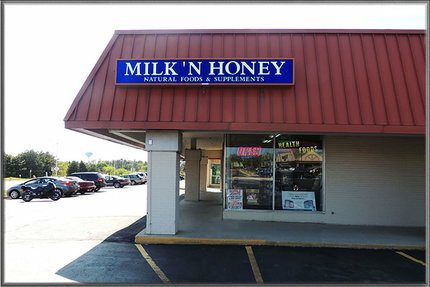 Milk 'N Honey is a family owned and operated health food store located in the Wauwatosa suburb of Milwaukee, Wisconsin. We have been in business for 33 years. Wholesome food, high quality nutritional supplements and warm, friendly service is what you will experience when you walk into Milk ‘N Honey. A knowledgeable staff is available to answer your questions and provide up to date information on a wide range of health topics and products. Our goal is to provide you with nutritional solutions to health challenges and help you make informed decisions as to how best to deal with health concerns. A certified nutritionist is on staff for nutritional counseling. We promote wellness through following the "Healthy Cell Concept." This concept involves eating a diet rich in whole foods, regular elimination of the wastes of metabolism and detoxification, maintenance of strong immunity, regular exercise and a healthy mental attitude. Please read our series on the "Healthy Cell Concept" elsewhere on this website. We provide high quality nutritional supplements from Nature's Plus, Now Foods, EuroPharma, New Chapter, Garden of Life, Source Natural's, Enzymatic Therapy, Carlson, Pure Essence, Solaray, Nature's way and other high quality companies. We carry a good selection of homeopathic remedies in both single and multiple ingredient formulas. We carry a fine selection of immune boasting formulas and specialty products such as black seed and CBD oil. We specialize in whole food concentrates such as Barleylife, Just Carrots, Redi Beets and Leaf Greens from the AIM company. We carry high quality cleansing products such as Herbal Fiber Blend and Ultimate Cleanse. We provide a wide range of high quality sports nutrition products including state of the art protein supplements. Like the old fashion store of yesteryear, we provide a wide selection of bulk grains, beans, pastas, herbs and nuts and seeds. You can purchase only what you need as opposed to having to buy prepackaged products. We have available a wide variety of body care products, essential oils and weight loss supplements. Organic eggs, organic frozen fruits and vegetables and natural cheeses are some of the food products we carry. We place great importance on nutritional education. Please visit out Article Library for information on ways to deal with health concerns from a nutritional perspective. Read our Nutrition 101 series and The Healthy Cell Concept series to learn about the nutrients our body needs to experience maximum health. See our Newsletter page for up to date information on various health/nutrition issues and new products.